New York, NY, February 21, 2018 --(PR.com)-- Leading gift and housewares company, Design Ideas, announces a revolution in home shelving. 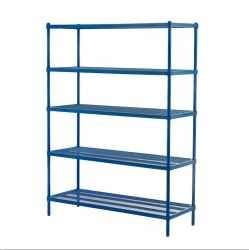 MeshWorks® shelving combines the dust free properties of traditional wire shelving with the flat surface traditionally associated with solid metal or wood. The patented secret to this innovation is the expanded metal mesh material that the company first introduced to American homes in 1986. “So many times a new product will solve one problem but create another. Traditional wire shelving allows circulating air to help prevent dust, but many objects fall between the wires or don't sit level. MeshWorks® offers the dust fighting properties of ventilated shelving while providing a smooth, level surface for storing any size object,” Andy Van Meter, President of Design Ideas, explains. The cleverly engineered and patented mesh shelves utilize a larger gauge of expanded metal mesh to achieve the style, strength and functionality that the industrial wire shelving units fail to offer. The level mesh surface prevents smaller objects from tipping over or falling through, a typical problem for wire shelving. But because the process for expanding metal transforms a single foot of steel into three feet, the resulting shelf is light weight but extremely strong. Each shelf has a weight limit of 600 pounds, ensuring the safe storage of anything from small kitchen items appliances to heavy sacks of gardening supplies. The MeshWorks® shelving system comes with an extensive array of accessories allowing the consumer to customize configurations for any specific application. Over 15 different accessories can be combined to create closets, bureaus, coffee tables, media stands, hydroponic gardens, bathroom stands, office desks, work benches, wine racks, industrial storage, and pantry organization. Retailers can offer the components separately or as stand-alone kits packed to carry out of the store or ship directly to homes. Design Ideas will debut its innovative MeshWorks® shelving systems for the first time at the International Home and Housewares Show in Chicago, IL from March 10-13, 2018. With a focus on revolutionizing the industry, Design Ideas will continue to present upscale storage solutions, home accents and novelty accessories at affordable prices. For additional information on MeshWorks® shelving and other Design Ideas products or custom items, please visit www.designideas.net/meshworks.